Back Row Left to Right): Assistant Coach Chip Mixson, Assistant Coach Ray Gorle, Assistant Coach Bruce Scandling, Dylan Hickey, Zach Mixson, C.J. Corso, Joe Ayers, Kalen Meek, Assistant Coach Mark Hickey, and Head Coach Jim Ayers. Middle Row: Ryan Gorle, Wilbur Ridgeway, Zach Kohan, Brett Fairchild, Isaac Cadiente. Front Row: Jake Dutton, CJ Keys, Chris Dillon, Sergio Magallanes, Nick Wolf, Greg Smith, and Evan Scandling. 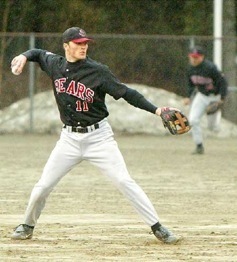 The Crimson Bears returned seven starters from the 2001 squad and dominated Region V play, compiling a 13-1 record. But the season didn’t start off as well for the Bears, who dropped their first game of the season to Ketchikan 12-7. However, the loss may have been a blessing in disguise for the Crimson Bears. And like all teams destined for greatness, JDHS came back even stronger. Not only did the Bears win their final 13 games, they simply overpowered the competition, batting .372 as a team and averaging 10.6 runs per game, while their pitching staff held a 2.09 ERA. The Bears reached the state title game by edging East Anchorage 5-4, in a tightly contested game, in the opening round of the state tournament. They followed by knocking off Lathrop 9-3, to claim their first ever state title in school history. Joe Ayers, Dylan Hickey, and Nick Wolf were all named to the All-State Tournament team. 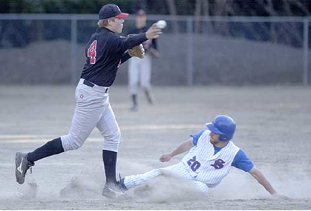 Dylan Hickey rounds third base and heads for home against Sitka. 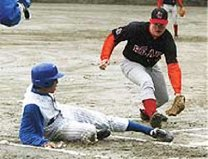 Joe Ayers steals second base against Lathrop. Zach Mixson attempts to turn a double play against Sitka. Kalen Meeks reaches to tag out a Sitka base runner at home.